A spectacular display of salmon-pink leaves. Stunning salmon-pink leaves in spring make an impact even in the smallest of gardens. As the leaves mature, the pink fades but the attractive variegation remains. A small and slow growing tree, ideal for oriental-style gardens and great in modern containers. Easy to manage and virtually trouble free - requires little maintenance and can be grown in sun or light shade. Supplied in a 2L pot, eventual height 2m in 10 years. One of the prettiest, compact-growing Acers for smaller gardens, pots and patios, this striking small tree gives you plenty of fabulous colour through the year. In spring, the dainty, lobed leaves emerge salmon pink, covering the bush in a soft peach glow - a fabulous sight to behold - before maturing to a variegated lime green and cream. Then, in autumn, the leaves turn a uniform lime-green before falling. 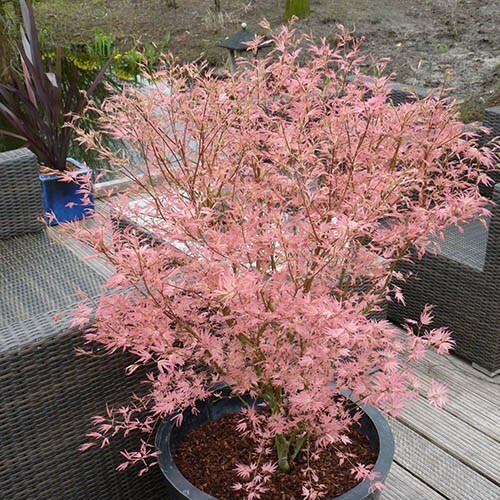 Fully at home in Oriental-style gardens, flower borders or on your patio in a large pot, where it can remain for 10 years quite happily, Acer 'Taylor' is a garden plant that no gardener should be without! Supplied in a 2L pot, ready for you to plant out or pot on. Supplied as an established plant in a 2L pot, ready to plant out. Plants enjoy regular watering and a sheltered position to keep the leaves at their best. Leaf colour is best in partial shade, although full sun can be tolerated as long as the plant is well watered. When positioning your acer, avoid exposed places as leaves can suffer with wind-burn (scorch), especially if the plant is dry. Allow your Japanese Maple to get used to a whole day in the sun by starting it off in the shade, then standing it in its final sunny spot (in pot or in the garden soil) for one hour longer every day for a week. If planting in the garden, prepare a wide hole and loosen the soil with a fork, incorporating organic matter as needed to improve moisture retention and condition. Plant your Acer palmatum so that the top of the root ball is just slightly below ground level. Fill the planting hole with soil and heel well in.